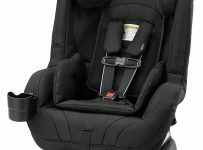 The RECARO ProRIDE Convertible Car Seat is one that has been popular with parents for a while now and it’s not difficult to see why. The car seats design has been inspired by the best and safest racing car seats which not only makes this car seat super trendy, but also super safe. What makes this one of my personal favorite convertible car seats is that everything is just super simple. The head rest is adjustable, the 5 point harness can be adjusted without the need for rethreading, the cover can be machine washed and it’s super adaptable, compact and safe all at the same time. How does the RECARO ProRIDE compare? The RECARO ProRIDE is a popular car seat for many reasons but one that I love is just how long it can be used. The car seat can be positioned rear facing from 5 to 40 lbs. If your child grows too large for this, you can turn the car seat around and have them positioned rear facing from 20 to 65lbs which is a great weight limited. 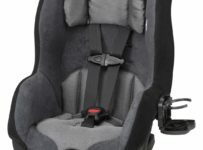 The straps are super easy to use and they don’t seem to get twisted – there is an indicator which tells you if this happens and they are far better than most other car seats I’ve used. I also love that the 5 point harness does not require rethreading making it super simple when your child grows, and there is a recline feature when the car seat is positioned rear facing. This convertible car seat has tethered straps that can be tightened to improve the safety of the car seat when locked into place. The 5 point harness provides the ultimate protection in the event of an accident and can easily be re-positioned without threading for a growing child, but this isn’t the best part. The side padding of this car seat is substantial and should leave you with no doubt that in the event of an impact, your child will be protected. The headrest has also been designed in such a way to limit head movements which also works to improve the safety profile in a potential accident, keeping your child as protected as they possibly can be. I found the pocket in the back to be handy as it can be used to store straps when not in use and to have you from having messy straps laying around. The cover is machine washable which means you can keep it looking great over the years and most parents have found it to be incredibly durable. The fabric doesn’t trap heat and ventilates well so it’s great for use on even warmer days and there’s also removable cushion inserts. Most of the reviews for the car seat have been overwhelmingly positive, but even so some parents have found the latch system slightly too wide which makes installation when rear facing more difficult. However this doesn’t affect the safety profile. The seat also lacks cup holders and although this isn’t an essential element of a convertible car seat, there is no doubt that they are handy. However for a lightweight and adaptable car seat most parents will find this to be something worth sacrificing. Click here to read more reviews of the RECARO ProRIDE convertible car seat. I must say, I absolutely love this car seat. It’s clear that a lot of effort and attention has gone into creating a car seat that is super safe and easy to use, and after all as parents this is what we want. I can’t say it’s perfect as this would be wrong – I would have loved the addition of a cup holder. If this is something you can’t see yourself sacrificing on, check out the RECARO Performance SPORT. Either way, you’ll be buying a quality car seat that is sure to last for years.